Avocado Hummus and a Featured Soup! Avocados are so good and since I was making some more homemade hummus, I decided to experiment by making an Avocado Hummus. It came out pretty much like I thought it would–really smooth and creamy, with that great avocado flavor, but also the traditional flavor of hummus mixed in. It makes a great dip, served with pita bread, tortilla chips, or crackers– or spread it on some crusty bread and top it with tomatoes and some crumbled feta cheese for a light lunch! 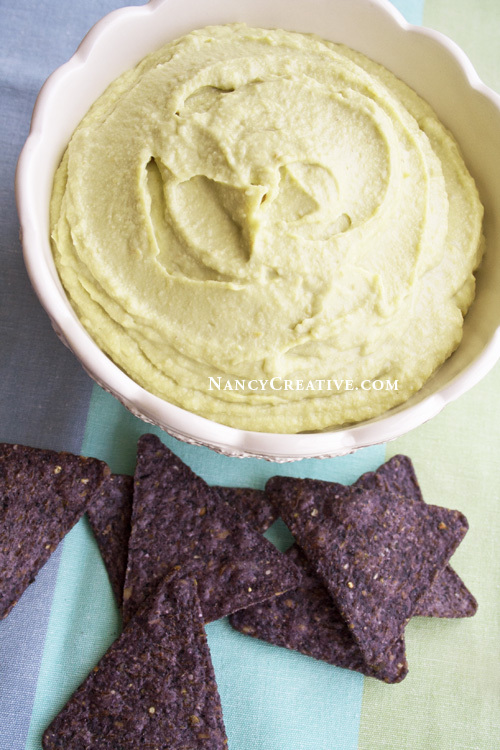 If you like trying different flavors of hummus, you’ll have to make this sometime! Put all ingredients, except the salt, in a food processor or high-speed blender and blend until smooth and creamy. If mixture is too thick, blend in an additional Tablespoon or two of water. Stir in the salt, to taste, if desired, then spoon hummus into a small bowl and serve with pita bread, tortilla chips, or crackers. I’ve also made Lemon Artichoke Hummus, Black Olive Hummus, Black Bean Hummus, Sun-Dried Tomato Hummus, Pumpkin Hummus, and a basic Hummus. I never seem to get tired of eating it! 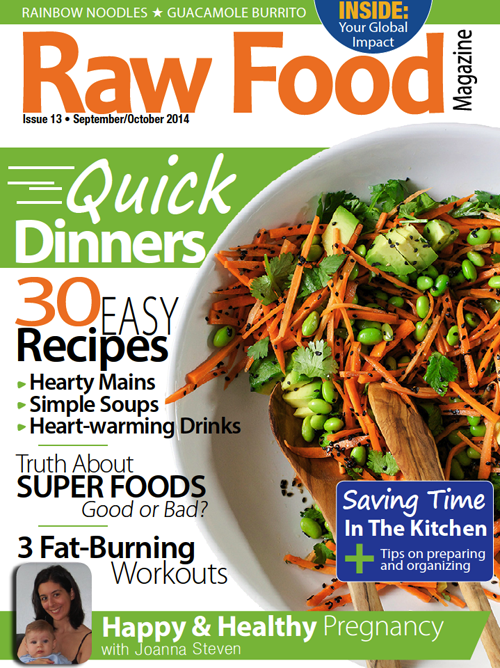 I wanted to mention, too, that I have a healthy soup recipe featured in Raw Food Magazine, in their latest September/October issue! It’s a digital magazine filled with lots of healthy recipes and articles on fitness, nutrition, and living a healthy lifestyle. You can find out more about it at RawFoodMagazine.com. 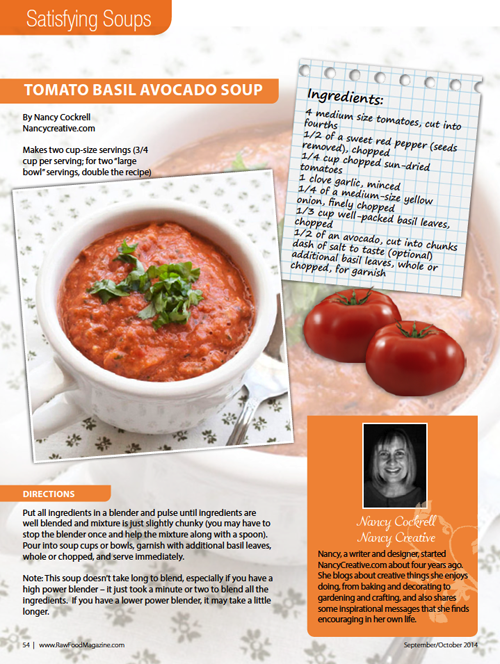 You can also find my recipe for Tomato Basil Avocado Soup on my blog right here. It’s an easy, delicious, raw food recipe. Do you use raw food recipes often? Linked to Fiesta Friday at The Novice Gardener. This entry was posted in Appetizers/Snacks, Food and Recipes, Healthy Eating, Spreads and Dips and tagged Avocado, avocado hummus, chickpeas, featured, garbanzo beans, Hummus, Lemon juice, olive oil on September 19, 2014 by nancyc. That hummus is awesome too :). It does have a very subtle light green tint to it, but it’s a little hard to see in the photo! Hi Nancy, congrats about the recipe feature in Raw Foods magazine that is wonderful, love the avocado hummus sounds delicious! This sounds oh so yummy Nancy! oh, and congrats on your recipe being in the magazine! Super exciting, and it does indeed sound wonderful! Congratulations on the feature Nancy! That is a great achievement! Love your avocado homous as well as all the other ones you have made too – love the sound of the artichoke one…Thanks for sharing this with us – Happy Fiesta Friday! Love hummus and avocados …perfect recipe! Where do I start? I love the idea of avocado hummus. The soup is so creative. I am sure it gave it an amazing thick consistency. Yum. Beautiful Nancy, the hummus looks amazing! It’s great that your entry was featured too. The hummus looks wonderful, and so happy for you, congratulations on the recipe feature. The soup sounds great!! Mmm! Just love hummus and make it really often! Will try yours very soon! Thank you! :) Hope you get a chance to try the hummus! Ooh that hummus looks yummy! Congrats on the feature! Congrats on the feature, Nancy! And this is definitely a new hummus that I need to try! This looks delicious Nancy, congratulations on your soup feature!